Mack’s three combined tackles in the game are certainly slightly below average compared to his regular stats in Oakland—where he played every game for four years until a holdout got him traded (and then paid) a week ago. But in the final three minutes of the first half, specifically, he showed what he was worth by making the Bears’ two best plays in the game. Granted, these came against Packers back-up QB DeShone Kizer and not the injured Rodgers. But Mack’s heroics made it feel like he was in total control of the entire game—something rarely said for any defensive player. First, with Green Bay in the red zone and three minutes remaining in the second quarter, Mack jammed a receiver, said a quick hello to the RT Bryan Bulaga, and then finally went straight to the ball, stripping Kizer for the fumble that Mack recovered. That led to a Bears three-and-out, but on the ensuing Packer possession, Mack put himself in perfect position as Roy Robertson-Harris took down Kizer, catching a weak desperation throw and evading multiple tacklers on the way to the end zone for the pick-six and a 17-0 Chicago advantage. This was a one-point game in Week 1, so we can’t reasonably draw a lot of conclusions here. 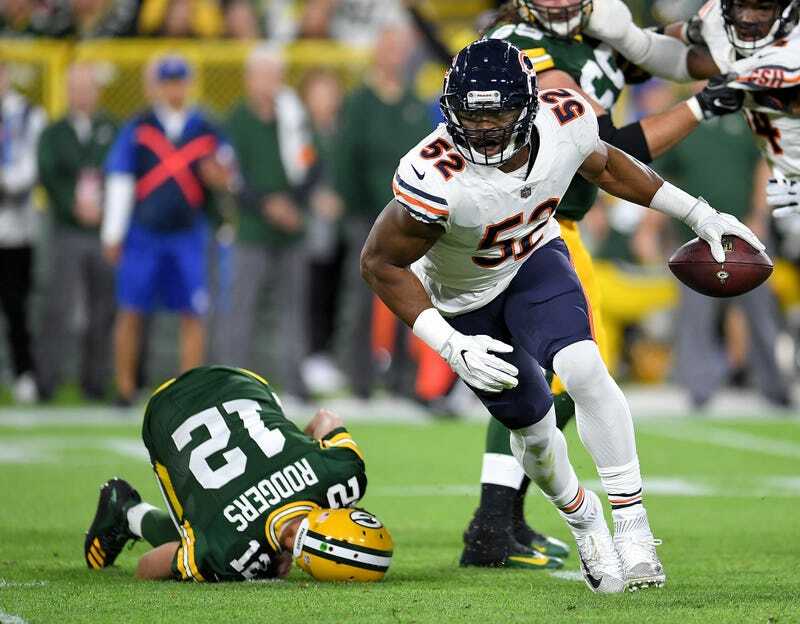 But what was definitely true on Sunday night is that Khalil Mack made the Bears’ defense legitimately scary, if only for about one half or so. Meanwhile, Jared Goff should be a lot more relaxed about playing the Raiders tonight.